NeuroVue® Dye Filter is useful for neuronal tract tracing studies of up to 3-4 weeks. Spectrally compatible with most fluorescent genetic tags, and NeuroVue® Red, Orange & Emerald. 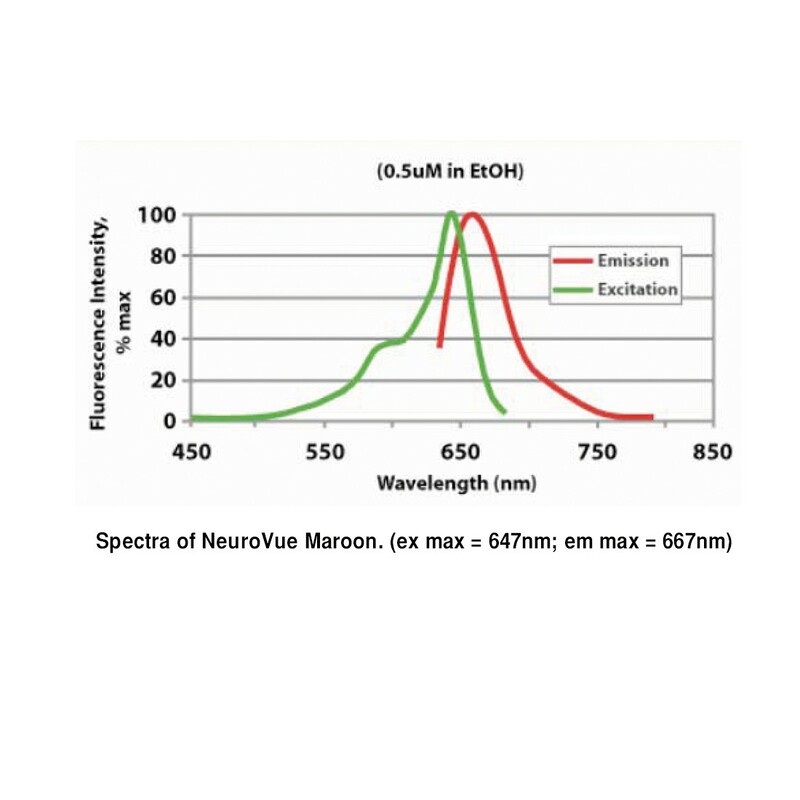 Maroon (ex max=647nm; em max=667nm). Diffusion and Imaging Properties of three new lipophilic tracers, NeuroVue® Maroon, NeuroVue® Red and NeuroVue® Green and their use for double and triple labeling of neuronal profile. B Fritzsch et al. Brain Res Bull., 66, 3, 249-258 (2005). A disorganized innervation of the inner ear persists in the absence of ErbB2. JK Morris et al. Brain Res.,1091:186-199 (2006). Al-Mehdi AB, Patel M, Haroon A, Reed D, Ohlsson-Wilhelm B, Muirhead K and Gray BD. Increased Depth of Cellular Imaging in the Intact Lung using Far Red and Near Infrared Fluorescent Probes. Int. J. Biomed Imaging. 1-7 (2006). NeuroVue is a registered trademark of PTI Research, Inc. For patents see list.